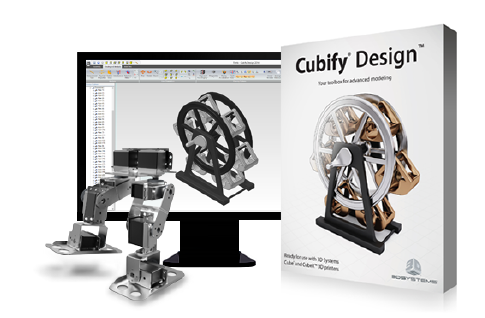 Cubify Design, by 3D Systems, is a computer-aided design (CAD) software that allows users to create complex parts. Users can create original designs or import 3D models to edit. Acceptable file types are IGES, STEP, SAT, DXF and DWG. Create assemblies of multiple parts. Animate designs with moving, interlocking and articulating parts. Create 2D drawings or plans for your designs. Export 3D-printable STL files for your designs. Cubify Design is available for Windows computers for $199. A free 14-day trial is available to allow you to try the software before you buy it.